We were buffing up 29 West for our December wedding, and it was the proverbial labor of love. We stripped off wallpaper in every room and painted or repapered to suit our own taste. We took up boring beige carpeting and refinished all the beautiful pine floors. We tiled bathroom floors and built closet shelves. I cut fabric and made curtains for twenty-two windows. Marsh cut Formica and made new kitchen countertops. Every night and weekend, we worked until one or two in the morning. The place shone by the big day, December 23, and Christmas decorating added to its charm. Swags of pine branches hung from every mantelpiece, with sprigs of juniper and holly berries tied on with gold ribbon. Brass candlesticks sat amid more greens decking the mantels, the lit candles made to flicker by the drafty old windowpanes. Shiny red apples, stuck to tall Styrofoam cones with toothpicks and spaces between them filled with holly sprigs, resembled miniature Christmas trees and served as centerpieces on the kitchen and dining room tables. 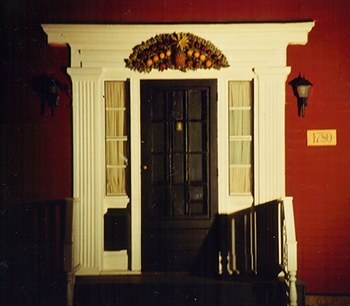 Outside, above our front door and spotlighted from below, was Marsh’s re-creation of a colonial holiday favorite: a pineapple, considered a symbol of welcome, centered on a wooden half-circle and surrounded by arches of apples and oranges. All of our children and grandchildren gathered to share that evening with us: Marsh’s daughter Lisa, from Austin; son Jeff and his wife, from upstate New York, with their kids Tyler, Hannah, and Emily; both of our daughters named Jennifer, and Michael. They joined our mothers, Marjorie and Mary; Marsh’s sisters Marilyn and Julie; my brother Jim, and assorted nieces, nephews, and close friends, as fifty people crowded into our tiny dining room for the ceremony. We were married in front of a low-burning fire by Jonathan, brother-in-law of our best friends in Westborough. Jonathan was a tall, gaunt-faced Englishman and a minister at Old North Church in Boston. He looked every inch the vicar, whether in or out of his Episcopalian robes. We opted for traditional vows, and Jonathan insisted we each say them in their entirety, as opposed to repeating after him. Our recitations were less than stellar. I all but whispered mine, I was so nervous about screwing up and missing a section. And Marsh surprised no one when he broke down while saying his; he’d been known to get teary-eyed during TV commercials. He only made it as far as “I take thee, Ellen, to be my wife.” Wedding photographer Gus captured the moment in a great shot of the two of us, pausing for a kiss of encouragement before Marsh gave it another try. "Like most people living in a foreign country, Marsh and I savored the cross-cultural education we received from the locals. Among the many lessons we learned from our building crew, one of the most endearing was how to milk a situation for every last drop of a good time. 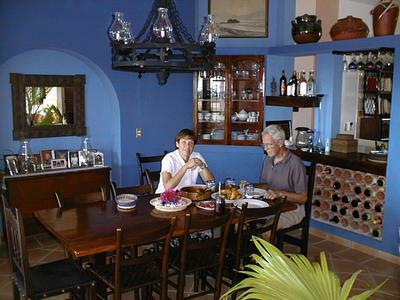 Take, for instance, our deciding on paint colors with Marcos, the painting contractor. As he hand-mixed the colors and applied big squares on the porch as samples, masons sauntered by, as if by chance, and stopped to offer their opinions. The porch wall filled with the cobalt blues, egg yolk yellows, and hot pinks I was asking for, and the crew chimed right in, apparently as enthusiastic about the vibrant colors as I. “More heat in the pink, Marcos. That pink looks like a big wad of bubble gum,” one of them said. “That yellow will be orange in the late-afternoon sun. It could be pretty, though,” said another. "I like the blue, Senora. It's beautiful," another one said. Maybe you could put it on two walls in the dining room instead of just one." Or take the crew’s reaction to our son-in-law, Patrick, when he and Jennifer joined us for the Christmas holidays. I came up the stairs from the bungalow to find him next to the pool, slathering suntan lotion on his six foot four inches of pale Irish skin. I looked up and saw eight men, standing on the roof in a straight line, arms folded across their chests, staring silently at Pat. “What?” I asked them, raising my arms and flicking my wrists. Pat didn’t need a translation and laughed along with everyone else.